If you want to have a meal that satiates your tummy, tickles your taste buds and stays in your memory for a long time, try Punjabi! Punjabi cuisine ranges from semi-spicy to spicy, and is almost always rich, with abundant use of ghee and butter. Have a Punjabi Paratha and a tall glass of their creamy Lassi for breakfast and you will not feel hungry till lunch-time! From signature Punjabi food recipes like Sarson ka Saag and Makki Di Roti, breakfast delights like Chole Bhature, Bread Pakora, parathas with mango pickle to homely treats like Aloo Paratha and Aloo Gobi, and lip-smacking delicacies like Paneer Tikka and Baingan Bharta, this section will introduce you to several ‘famous and favourite’ Punjabi treats. All dairy products are abundantly used in Punjabi cuisine, but paneer is one ingredient cooked in every way possible – marinated, fried, sautéed, crumbled, and so on, to make delicacies that span every course of the meal, from appetizers to desserts. 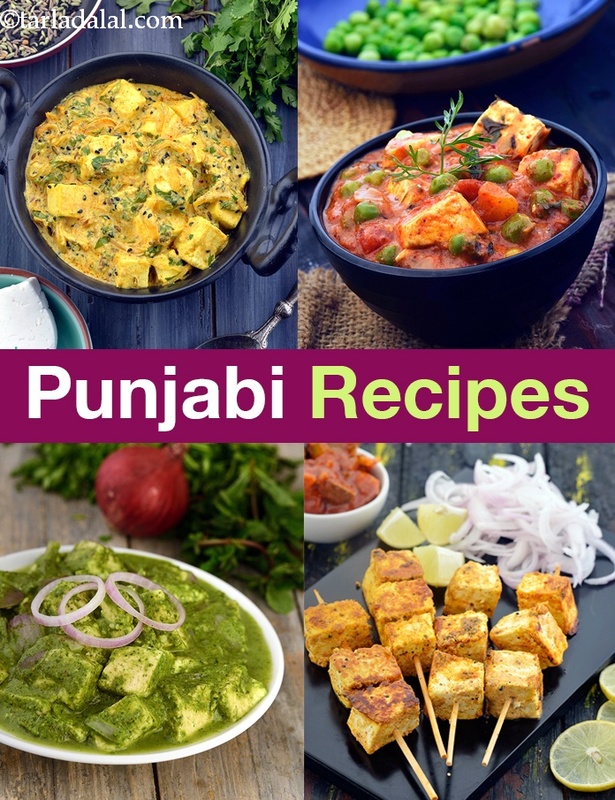 Check out Punjabi Paneer recipes to explore dishes that will help satiate your Punjabi food craving. Shorba are famous across South, Central and Middle Eastern Asia. But, Punjabis have adapted them according to the Indian palate. Start your meal with a bowl of thick and often spicy shorbas like the curd shorba with comforting flavor that will surely soothe you when you had a long day. Also, our Punjabi Shorbas, Soups recipes section has varieties of shorba made using dal, vegetables or a combination of both. Tandoor is a traditional aspect of Punjabi cuisine and used for baking or cooking flatbreads and a wide range of starters like kebabs and tikki. Marinate baby potatoes in a spicy red red chilli-based masala paste, fenugreek leaves and fresh cream and create these aromatic Tandoori aloo that are a perfect party starter! In the same manner you can marinate multiple vegetables and cook them to make a scrumptious and tasty, Tandoori Aloo Gobi Sukhi Subzi. Spicy potato curry served with piping hot puris, the Punjabi Aloo Puri is one of Delhi’s most favorite street foods. Boiled aloo with peppy chaat masala, lemon juice, mint and coriander makes tempting Aloo Chaat. You can also bake an array of flatbreads like Pudina Naan, Whole Wheat Coriander and Sesame Seeds Naan or Whole Wheat Masala Paneer Naan and relish with subzis or accompaniments Punjabi Raita / Chtutney / Achar recipes. To know more about Punjabi flatbreads, have a look at Punjabi Roits, Parathas recipes Punjabi subzis are not simple accompaniments. Even the easiest of their subzis are a delight with rich flavour and luscious texture. Expose your taste buds to some real excitement! This easy to make Jeera aloo tastes amazing with puri. Bharwan Baingan is made by stuffing brinjals with an onion-coconut paste and slowly cooking them in a kadhai. Apart from the Punjabi Subzis, there are heavy gravy preparations because of ungrudging use of ghee, cream and other dairy products, which is what makes them so tasty too! Toss in some vegetables, paneer and spice powders to whip up delectable gravies. Treat your palate to all-time favourites Punjabi veg dishes Paneer Makhani, Kadhai Khumbh Sabzi or Matar Tamatar. Dal and Kadhi provides with the nutrition required for proper development and help in balancing the meal. Punjabi Dals / Kadhis recipes has some quick and easy to prepare dals and kadhi that can be included in your daily routine. Dal tadka and Dal Makhani are famous Punjabi dishes.End your meal on a sweet note and savor on some Phirni served in earthenware bowls called ‘shikoras’. These are popularly known as ‘matki phirnis’ and are served at most Punjabi restaurants and functions. Also, you can make Dry Fruit Barfi with a rich milky flavour and amazing melt-in-the-mouth texture. Enjoy our Punjabi Recipes collection. Below you will find other Punjabi recipe articles of interest. A tasty sabzi made from baby potatoes in a tasty dry achaar masala. This dish is almost a meal in itself. Potatoes and sweet potatoes are grilled with butter, then topped with curds and spices and garnished with grated radish and spring onions. A punjabi cuisine specialty aloo capsicum special or potato and capsicum vegetable preparation in true north indian style is irrestible! Soft potatoes and cauliflower florets are sautéed with cinnamon, dry ginger and turmeric and other spices and then pressure-cooked with rice for a tasty one-dish dinner. Served hot garnished with mint springs for a comforting dinner. Your all recipes are wonderful. I have tried your Moong soup recipe. Tarla Dalal Hi Pranita, Happy to know you liked the recipe. Do try more and more recipes and share with us your feedback. Happy Cooking! Tarla Dalal Delighted to know you loved our recipes especially the chana dal halwa. Do try more and more recipes and share with us your feedback. Happy Cooking!